Following on from our post last month about how to grow Raspberries I thought it was a good time to follow this up with a discussion on how to Prune them as well. Raspberries are best pruned in late winter, usually February, so that's not long to go. Raspberries spread through suckers. This means that raspberries will spread out beyond the original spot if you let them. However large, un-pruned raspberry bushes don't yield any more berries and can actualy lead to problems or lead to the premature death of the bush itself. Pruning raspberry plants therefore does more than just keep the bushes under control. Raspberries can also be prone to a number of diseases and so pruning out old stems can reduce the spread of disease throughout your plants. Cut back all the canes that fruited last year to ground level in February as they wont fruit again, the old canes will have a gray bark. Remove any thin, weak or stubby canes, take out any that show any signs of damage. In the summer you can also reduce the number of canes slightly if they are overcrowded or if there are any dead or diseased canes. Leave about 4 or 5 of the healthiest looking canes on each plant, and tie these into the supports. By doing this you should get a better harvest the following summer. Here is a useful video from Youtube explaining the techniques. 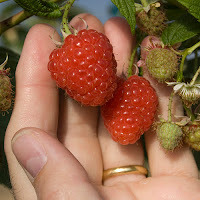 I'm getting ready to prune my raspberries and definitely needed to brush up on how to do it (I don't know why I can never remember how to prune -- maybe because I grow a ton of different woody perennial fruit species and they're all different). Great post, made me feel a lot more confident! Good luck it is easy to do, let us know how you get on.